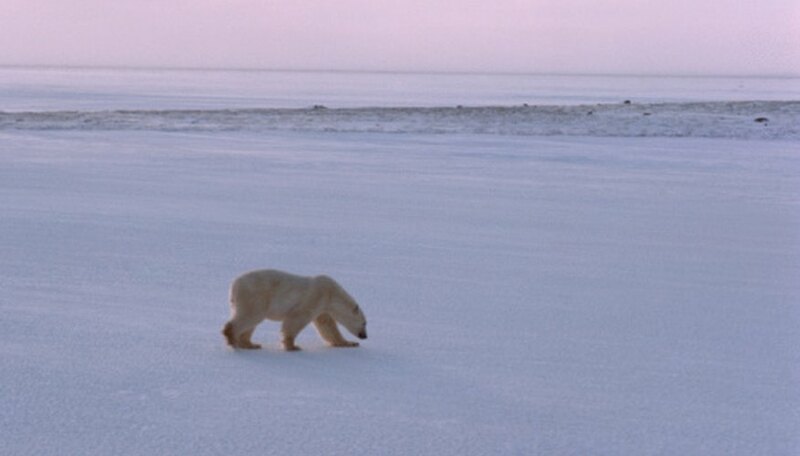 The tundra is the coldest natural environment on the planet. There are two different types of tundras, the "Arctic" and the "Alpine tundra." While the Arctic tundra is located around the North Pole, the alpine tundra exists in mountains all over the world at altitudes where trees are no longer able to grow, says the website of University of California Museum of Paleontology. They both have extremely cold climates as well as very low diversity of life, as not a lot of animals and plants are suited to survive in such severe conditions. Mosses are the most common plant in the tundra as they are extremely well adapted to the living conditions of its climate. They don't have stems and their leaves are very thin. They don't require a lot of sunlight and can stand the cold to minus 25 degrees Celsius. They reproduce by shooting spores and therefore never develop a flower. The two most common mosses of the tundra are called the "arctic moss" and the "caribou moss." Tundra willows grow very low to the ground, as they would not survive if they were too tall. According to the Blue Planet Biomes website, the leaves of tundra willows are oval shaped with pointed tips, wedge shaped bottoms and are equipped with little stalks. The willows bloom in summer, when they produce seeds and reproduce. The most commonly present willows of the tundra are the "arctic willow" and the "diamond-leaf willow." In addition to being adapted to the cold weather and a frequent absence of sunlight, bearberry is also able to grow and live in dry and unfruitful soils. The bearberry grows low to the ground, and blooms in the spring, between May and June. When it finishes blooming it produces a fruit in form of berries. According to the Blue Planet Biomes website, the plant gets its name from the bears that like to feast on its berries. Despite of the extreme climate, there are some flowers, which are capable of surviving in the tundra. The Blue Planet Biomes website lists the "Labrador tea," "pasque flower" and the "tufted saxifrage" as examples of flowers that inhabit the tundra. These flowers bloom in the summer. They all grow very low to the ground in order to preserve as much heat as possible. The colder it gets, the less the flowers grow upwards, but instead grow outwards, like a rug.